Please click on the link below to view updated part numbers. Hipot (Hi Pot), Ground Bond Testers and Dielectric Withstand Instruments for performing safety testing on electrical components and products to ensure they meet operator safety requirements and comply with UL, CSA, IEC, and other standard certifying bodies. LCR Meters Meters are used for impedance measurements (inductance, capacitance, and resistance) to characterize the performance of a variety of electrical components and materials. Megohmmeters measure high resistance or insulation properties. Milliohmmeters measure low resistance or conductive characteristics on devices such as switchers and printed circuit boards. A QuadTech System provides automated electrical safety testing and may include a combination of an electrical safety analyzer, software, ac source, scanner, custom test leads, PC or more. Clicking the product links below will direct you to a new page on the Chroma website. Corona Discharge: an electrical discharge brought on by the ionization of a fluid surrounding a conductor, which occurs when the potential gradient (the strength of the electric field) exceeds a certain value, but conditions are insufficient to cause complete electrical breakdown or arcing. 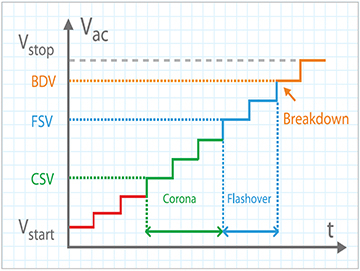 Corona discharge may be an early symptom of an impending breakdown. Flashover: an electrical breakdown of a gas that produces an ongoing plasma discharge, resulting from a current flowing through normally nonconductive media such as air. Vasily V. Petrov, a Russian scientist who discovered it in 1802, first described the phenomenon. Breakdown: a rapid reduction in the resistance of an electrical insulator that can lead to a spark jumping around or through the insulator. This may be a momentary event (as in an electrostatic discharge), or may lead to a continuous arc discharge if protective devices fail to interrupt the current in a high power circuit. © 2018 - 2019 Chroma Systems Solutions, Inc.